Lynn uses only positive dog training methods grounded in the scientific principles of animal behavioral learning. Also known as reward-based training, these humane techniques tap into dogs’ natural motivations (food, play, praise, etc.) to quickly and painlessly change behavior. The result? You get the well-mannered dog you want—while preserving trust and understanding between you and your dog. Lynn Medlin has dog training in her blood. Her grandfather, Wayne M. Colby, was a renowned Field Dog trainer in New England. Lynn inherited her grandfather’s love of working with animals, but followed a different path. Since 1991, she has focused her professional training on utilizing humane techniques to create a bond and greater understanding between pet and person. During this pursuit, her dogs have earned numerous Obedience Titles. 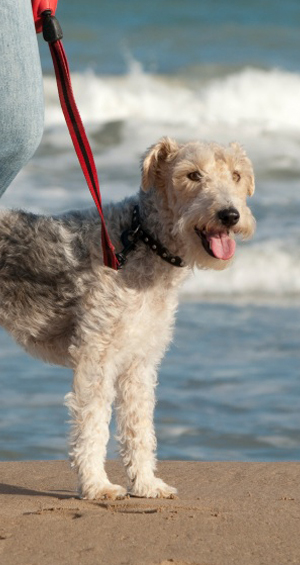 Through the years she has studied the issue of dogs that are reactive on leash. This has lead her to teaching Feisty Fido to help owners gain control and manage this challenging problem. An active member of the Association of Pet Dog Trainers, Lynn continues to update and refine her methods, staying current with the latest techniques and philosophies. She regularly attends animal behavioral seminars given by celebrated experts. Her latest passion is the new sport of K9 Nose Work. Lynn’s Staffordshire Bull Terrier, Baby Doll, has earned her NW1 Title with The National Association of Canine Scent Work. Through organizations like k9 Connection, the SPCA, and Love On Four Paws, she has worked with the blind, at risk and disabled children, and elderly citizens confined to hospitals or other institutions. Lynn’s passionate belief in the positive impact of therapy dogs resulted in her becoming the subject of an E! Entertainment special featuring her work with challenged children. 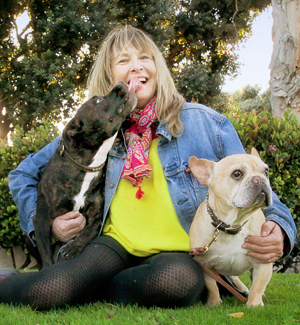 Lynn has served as a Board Member of the West Los Angeles Training Club, and is the Founder/Director of Training for k9 Connection. She has a particular passion for bully breeds. Lynn owns bully breeds herself, and takes great satisfaction in teaching responsibility of proud ownership. Cecilia was born and raised in Italy in a family of Equestrians. She started riding horses when she was 5 years old and eventually became a professional Equestrian. She won several European awards for show jumping, dressage and cross-country. Throughout her Equestrian career, she also owned and cared for several special dogs that were very helpful in her Equestrian duties. Spending time with her horses and dogs was a priority for her from a very young age. After several years in the Entertainment Industry in Los Angeles, she returned to her beloved animals. Six years of working as a professional dog walker, helped prepare her to co-teach classes with Lynn Medlin for Dog Town Dog Training. She also assists private clients with their training needs. Her studies at the Animal Behavioral College with a focus in Dog Training also aided her preparation to become a trainer. As did her certification from the Lucas-Agnew advanced learning program with a focus on Dog Psychology. She keeps herself up to date and frequently attends seminars and workshops. Cecilia strongly believes that the mental and physical health of pets should be a priority for every responsible dog owner. It is her belief that humans need to understand the needs of our pets and fulfill them as best as we can in order to create a healthy partnership for life. She also collaborates with Elephant Action League, a nonprofit association whose mission is the safety of Elephants around the world. In her spare time, Cecilia volunteers at the Santa Monica animal shelter. She is married to filmmaker, Adrian Fulle, and lives in Los Angeles with their young daughter Olivia. Lisa has always worked with animals, including several years of working in the veterinary field, where she learned how to safely handle and work around many different kinds of animals. Her love of horses also led her to search for a more positive method of training when she acquired a horse that had aggression issues. When the more “traditional” methods of other horse trainers were not working, Lisa turned to clicker training on her own, and instantly found success. She decided to take what she had already learned to the next level. In 2011, she graduated with honors from Animal Behavior College, and is now an ABC Certified Dog Trainer. She is currently working to earn obedience and Rally titles with her own dogs, in addition to earning Sheep Herding titles with her Boxer, Tess. 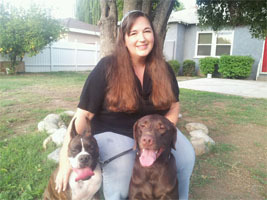 Lisa currently serves on the Board of Directors for the Boxer Club of San Fernando Valley and is an active member of the Association of Pet Dog Trainers. She regularly attends seminars and workshops in order to stay up-to-date with the latest positive training methods. 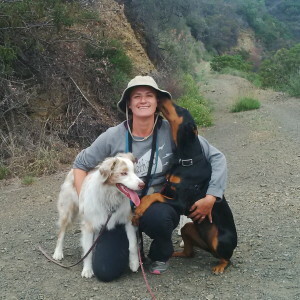 Her passion is working with dogs that are reactive on leash (currently having three reactive dogs of her own), and regularly assists Lynn Medlin with Feisty Fido classes. The American Veterinary Society of Animal Behavior (AVSAB) recommends that veterinarians refer only to dog trainers who practice positive reinforcement dog training. Read AVSAB’s full statement about the problems with punishment in dog training (PDF 2.7MB).